Abara LMS is a learning portal and an online learning platform meant to automate the delivery of eLearning and mobile learning courses to learners. To put it simply you can add users, courses, and assign them to learners, and view reports of completion, test scores, certificates, and analytics data. Abara, which means ‘coach’ in Igbo, an African language, provides the Learning Management System domain with an innovative and intelligent approach to e-learning. Built for today’s dynamic workplace, it leverages a mobile-first approach in the HTML5 user interface, and can be accessed on iPads, Android phones and desktops. Abara is truly modern, easy to use and world class. Use Abara and change the way your organizations learns. Intuitive Menu | Takes 1-2 clicks to reach most standard functionalities. Fully Responsive and Smartphone ready interface which support most commonly used mobile devices and operating systems. Add Badges and Points. Create leaderboards to allow learners to see how they rank alongside their peers and compete for better performance. Display your badges on Mozilla backpacks. Manage and deliver classroom training across multiple locations and batches. Monitor participation through attendance and assign an instructor to classroom sessions. View any of the 14+ pre-defined reports to monitor and measure group or individual progress against a single training plan, including other learning indicators such as certificates and competencies. Each report offers an extensive filter set to help you re-arrange and view data that matters to you most. Each report can be exported to a range of formats such as PDF and MS Excel. Schedule reports at predefined intervals like Daily, Weekly, Monthly or Yearly. Abara has an in-built shopping cart which has been linked to a PayPal payment gateway, which can accept payments through credit cards and PayPal account, enabling you to sell your courses online securely in bulk. You can also create discount coupons for a specific period/course(s). Setup assessments comprising Multiple Choice Questions, Single Choice Questions, Match the Following and/or Short Answer Questions. Build highly interactive assessments with documents & A/V inputs. Abara LMS is a Learning Management System which is truly Mobile-First and offers a hassle-free learning experience on mobiles, tablets, and desktops. 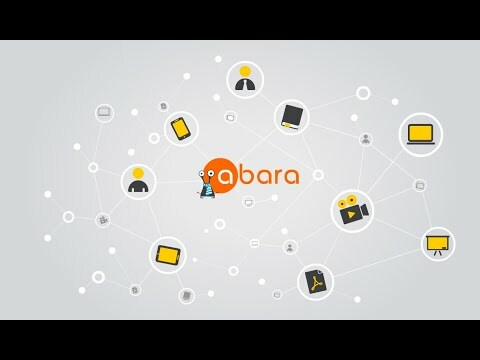 Watch the video to see why you should choose Abara #LMS. Q. I want to train my customers, partners and distributors, is your LMS suitable for me? Yes. You can set up Administrators from your sales, product or professional services teams. They can invite your customers, partners, distributors within the LMS and then can invite learners and start distributing courses. If you want to track completion you can do that or simply focus on distributing your courses. With Abara Enterprise LMS, you can have separate portals for training your employees and separate portals for customer/partner/distributor training. One can be managed by your HR/Training or L&D teams and the other portal can be managed by your teams that are responsible for customer/partner or distributor training. Q. I run a school/college, and want an LMS to train my students. Is Abara suitable for me? We have mixed feelings about this. Feel free to evaluate our system, but we think our system is more tailored toward corporate training and/or training companies. While the system could be used to deliver learning to your students, we feel the system may need to be customized quite a bit to fit into the mold of a Moodle or a Canvas, etc. It is possible, we may produce a variant of our LMS for the academic space in the future. But currently, Abara and its road-map is tailored for the corporate training space. Feel free to get in touch with us in case you feel the system works for you. Q. What is unique about Abara? It is a modern LMS built for a mobile-first world. It focusses on user experience and not just adding in a meaningless list of features. It is extremely simple to use, and administrators and learners love using it. Using your LMS should be fun and not stressful. It is a cloud-based LMS and is SaaS ready. Get started almost instantly, and avoid long set up and configuration phases. It is an ideal LMS for corporates and training companies. Whether you want to train your employees and/or your extended enterprise, the multi-portal architecture allows you to have separate portals of each set. If you are a training company with a need for multiple portals for corporate clients, the system allows you to do that seamlessly. Q. I need more than 1,000 active users. Will Abara work for my needs? Yes. Abara is hosted and architected around the Amazon AWS cloud hosting platform. We can offer high-volume servers setup for any usage pattern, whether you want 2,000 active users per month or 10,000 active users. For usage above 1,000 active users per month, we set up a dedicated server tailored to your usage patterns and performance expectations.